It was a magical moment when I learned how to ride a bike no handed. I saw someone on a TV show that had magical powers and they were driving a motorcycle with their eyes closed steering with their mind. I decided to try it out. I didn’t close my eyes but I let go of the handlebars and held my hands out in front of me thinking about which way I wanted the bike to go. I managed to keep this up for a full 3 seconds before grabbing back on to the bike. I immediately ran home and told my mother about the new powers I had discovered. Oh, what a rogue and peasant slave you are. I don’t ride bikes wearing peasant skirts anymore- numerous times I’m had holes torn in even the beautifullest of skirts. I don’t want this happening anymore. Oh, such a tangled purple yarn he weaves…perhaps another toaster oven? Pullover Biff…or is it a cardigan?! that’s a really good drawing of a bike! but isn’t yarn in a ball when you’re knitting? couldn’t the ball be sitting in his lap? HUH? Riding no handed seemed impossible until I start trying to do it. AND, WHAT IF BIFF TRIED RIDING A YARN BALL WHILE FIXING A BIKE? First time i tried riding a bike with ONE hand i collapsed, and landed about five metres away from the bike with a broken elbow. Look ma, no hands! …Or movement. Last time I rode a bike, I was in 6th grade. I flew over the handlebars and broke both wrists and my right elbow…right before a state piano competition. I’m a college senior now, and I’ve never missed it. I rode a bike once, but the stilts kept slipping off the pedals and the extension cord wrapped around the walrus just before the slack ran out. Painful memories. Needless to say, yet for some inexplicable reason I will anyhow, I don’t ride anymore. I rode a bike at full speed right into a parked car once. That wasn’t my intention, though. I simply wasn’t looking as to where I was going. The bike needed to get a new tire, my wrist needed to get a new cast, and the car wasn’t even scratched or dinged. I still bike regularly though. It’s simply too much fun and too efficient to pass off because of one incident where my attention lapsed. @Jake: You don’t HAVE a lap while you are riding a bicycle. Not only are your legs going up and down, they’re apart. You’d have to keep it in a little basket on the handlebars, and Biff would look like a twerp. My father recently took up knitting, and I’m hearing all the lingo that goes along with it. “Frogging it” is used to describe the event where a knitter unravels the yarn all the way back to the beginning and restarts the project. I don’t like riding bikes because I tend to shift my weight from side to side. Ive been known to rid emy bike for about 20 miles a day, no kidding. I remember my old bikes used to enjoy snacking on my coat when I hung it down at my waist, one time it enjoyesd eating it so much that it almost threw me onto the road. Actually, these hobbies *could* be combined. You just have to wrap the yarn around the wheel so that it feeds you the yarn when you pedal forward. 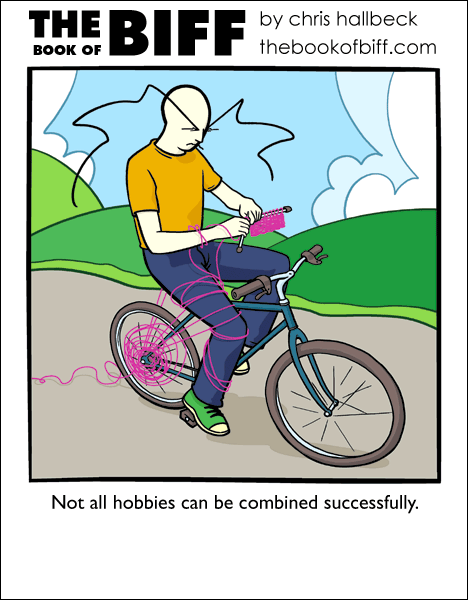 Then you just knit as fast as you pedal. I… I can’t ride a bike… -._.- I’m 19 years old and I can’t ride a bike… ‘TIS MY SECRET SHAME. I once biked directly into a tree. The back wheel flipped up to about a 45 degree angle before landing back down. When you push down and forward on a pedal, pull back with the corresponding arm. The end result is taking some stress off of your legs, as well aas powering through difficult terrain with relative ease. I bought a nice new bike recently after my housemate got one, i borrowed it a couple of times to get to work when i was running late, i realised it was cheaper (and healthier) than public transport. I did that with a kite and a bike, I look back and wonder what I was thinking was going to happen.